National Candy Cane Day is on December 26, and while that doesn’t mean it’ll keep us from munching on the sugary sticks as early as Thanksgiving, it does give us a chance to indulge as much as we can before New Year’s. With beginnings in 17th-century Germany, these sweet treats were curved to represent the shepherds’ crooks. They later made their way to the states in the mid-19th century. Now we see them everywhere, even on trees. Gregory Keller, a Catholic priest, invented a machine to automate the production of candy canes. In Albany, Georgia, Bob McCormack began making candy canes by hand as special Christmas treats for his children and friends. August Imgard, a German-Swedish immigrant, decorated a small blue spruce with paper ornaments and candy canes in Wooster, Ohio. The story of candy canes began in the Cologne Cathedral in Germany, where the choirmaster handed out the bent sweet sticks to his youngest singers to keep them quiet during the long Living Creche ceremony. If you're like our families, you might use this day to rest and recharge after days of bustling around for the holidays. It's the perfect excuse to curl up with some hot chocolate. Celebrate candy canes by crushing some up into your warm drink. You may be tired of cookies and other baked goods. If so, this will be the perfect treat since it's made with crushed candy canes, white chocolate, and milk chocolate. Peppermint bark can also serve as the perfect "thank you" for that sweet gift your received. It's the day after Christmas, which usually means the cost of candy canes has gone down a bit. Check out some stores to stock up. They last two to three years. Sometimes the sour taste is just the right balance needed. Wake up with some bacon (candy canes) and eggs! A main course and dessert — all wrapped up in one! If you've always thought candy canes were missing a spicy kick, then these are just right. Now if only they made candy cane mashed potatoes! You might live in a place where it's warm year-round and you never see snow. You might be too distracted by work and other adult things. But, everyone can agree that when they see a candy cane, they know exactly what time of year it is. Munch on a candy cane to jog your memories of a snow day with your siblings, or trading candy canes in grade school. They can bring on those special moments with just the rip of a plastic wrapper. 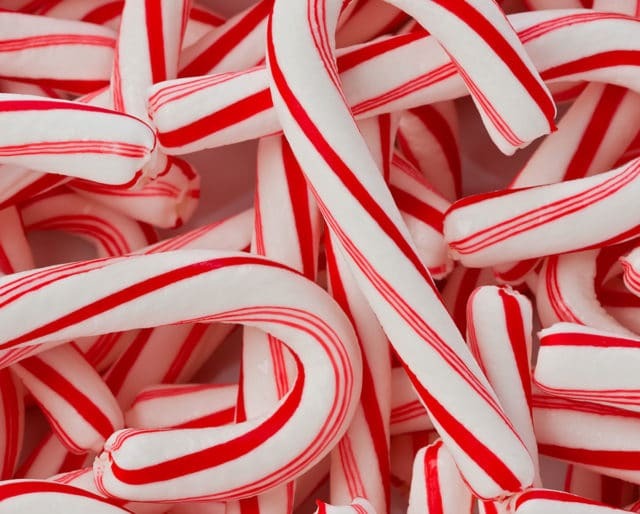 Candy canes are made of sugar, peppermint oil, and water. From helping with bad breath to serving as a digestion aid and mood booster, this peppermint candy can bring plenty of good to your life.